An Islamic extremist charged with involvement in the destruction of religious buildings in the historic city of Timbuktu in Mali in 2012 has been arrested Saturday and sent to the International Criminal Court (ICC). Legal scholars note that Ahmad Al Mahdi Al Faqi, aka Abu Tourab, is the first suspect in ICC custody charged with destroying religious or historical monuments, which is a war crime. The court said in a statement he was a member of Ansar Dine, an Islamic extremist group with links to al-Qaeda which ruled the break-away northern Mali from April 2012 to February 2013. Ansar Dine joined with separatist Tuareg forces to drive the Mali army out of northern Mali – an area the size of France – and declare the independent state of Azawad. Abu Tourab is charged with participation in the destruction of ten historic buildings, including mausoleums and a mosque in Timbuktu. An Islamic extremist charged with involvement in the destruction of religious buildings in the historic city of Timbuktu in Mali in 2012 has been arrested Saturday and sent to the International Criminal Court (ICC). Legal scholars note that Ahmad Al Mahdi Al Faqi, aka Abu Tourab, is the first suspect in ICC custody charged with destroying religious or historical monuments, which is a war crime. Al Faqi was arrested in neighboring Niger, and the Niger government surrendered him to the ICC after the court issued an arrest warrant for him. No date was immediately set for his arraignment. The court said in a statement he was a member of Ansar Dine, an Islamic extremist group with links to al-Qaeda which ruled the break-away northern Mali from April 2012 to February 2013. Ansar Dine joined with separatist Tuareg forces to drive the Mali army out of northern Mali – an area the size of France – and declare the independent state of Azawad (see Ben Frankel, “Short-sighted Tuareg leadership dooms independence quest,” HSNW, 17 July 2012). Abu Tourab is charged with participation in the destruction of ten historic buildings, including mausoleums and a mosque in Timbuktu. 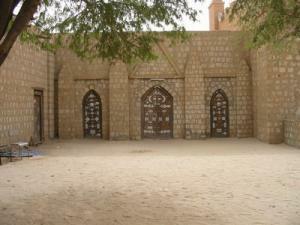 The BBC reports that UNESCO has listed the entire city of Timbuktu is listed as a world heritage site. In the fifteenth and sixteenth centuries Timbuktu wielded considerable influence in the Muslim world, and was the site of 180 schools and universities in which tens of thousands of students from all over the Muslim world received their training. The Islamic radicals who took over northern Mali in 2012 destroyed fourteen of the city’s sixteen mausoleums, typically one-room structures where the tombs of the city’s great thinkers were located. The Islamists consider such structures as totems of idolatry. Under the guidance of archeologists and religious experts, fourteen mausoleums destroyed in 2012 have since been restored with UN funding. In 2012 the Mali government submitted a detailed request to the ICC to investigate crimes committed on its territory. Prosecutors opened an investigation in 2013, after French expeditionary forces drove the Islamists out of northern Mali and unified the country. Abu Tourab is the first suspect detained as a result of the ICC investigation.